Quiet and compact, IM75 permits easy access to all machine parts. The integrated USB hub reduces the number of cables in complex installations. 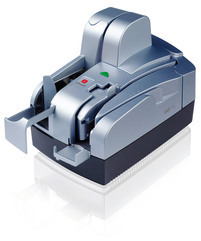 Options include a stamp, an endorsement printer and a magnetic badge reader. Environment conditions - Operating: 10÷40 °C, (50÷104 °F), 20÷80% R.H.
- Storage: 0÷45 °C, (32÷113 °F), 5÷95% R.H.
- Transport: -15÷55 °C, (5÷131 °F), 5÷95% R.H.